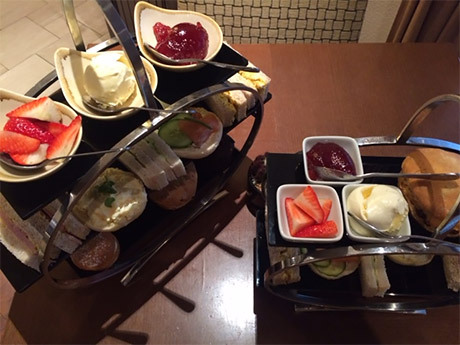 What could be more British than having cups of tea, cucumber sandwiches and scones filled with jam and clotted cream in a fancy restaurant? 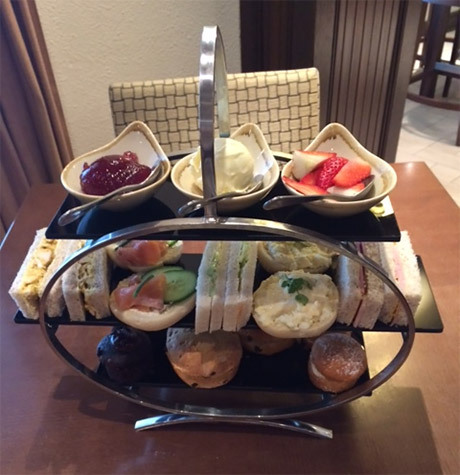 Afternoon tea is now being served between 12noon and 5pm daily in the Chats Bar in Swindon's Marriott Hotel and myself, along with my husband and 5 year old whirlwind of a daughter, were all lucky enough to be asked to sample it. Brought out on two suitably elegant afternoon tea stands, the sandwiches also consisted of a chicken and mustard/ham one. Besides that, there was a salmon, cucumber and cheese topping on half of a bread roll if you fancied something of the seafood variety. Enough of a range to please. Cake wise, there were little elegant chocolate fairy cakes that according to my daughter were delicious and very moreish. My husband preferred the scones with the jam and cream as he said it was the right amount of sweet for someone like him who really does have that kind of tooth. The little tiny style Victoria sponge cakes were the dessert that caught my eye but being gluten free meant everything was off the menu for me. 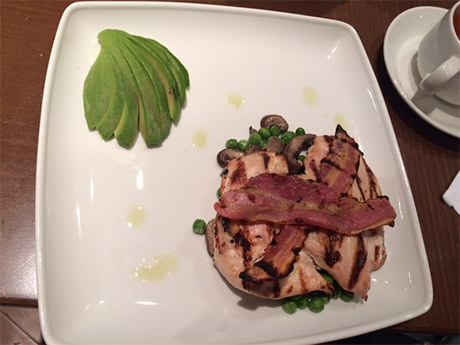 However, despite me not forewarning the team about this before i arrived, the catering staff asked me what i could eat and provided me with an alternative scrumptious paleo style lunch instead which consisted of chicken, greens, mushroom and avocado. All fresh, timely and simply the perfect portion size for this time of day. I am often made to feel like a nuisance when i reel off all of my dietary restrictions and needs, to the point that lately i have become nervous about eating out at restaurants. 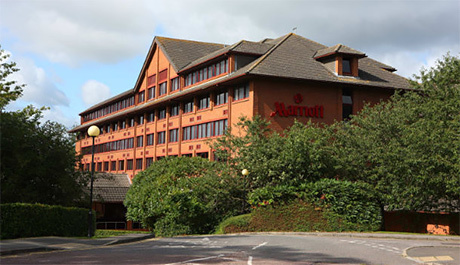 But I didn't get that vibe at The Marriott Hotel in Swindon. A special mention has to go out to our waitress for the afternoon - Lola Funsho. She added to the nice experience by being so warm and accommodating and yes you could say that all serving staff usually process that quality but in my experience, that's certainly not always the case - upmarket restaurant or not. Lola was a pleasure to be around and there should be more people in this industry like her. I hope her boss is reading this. Having never done the afternoon tea experience, I had no idea what to expect price wise but was pleasantly surprised to see that the cost was fairly reasonable. 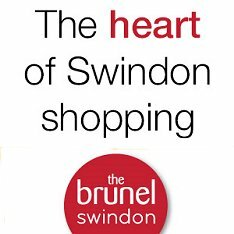 (£7.95 per person with tea or coffee or £13.95 per person with Champagne). This is not something you would do on a regular basis, not on an average parent budget anyway, but it's definitely a nice treat to occasionally experience. Child with you or not, you should try this out.